Corporation (ZBC) stations even broadcasting the manifesto launch of the main opposition party, the Movement for Democratic Change (MDC) Alliance, while police have allowed most civil society organisations to carry out their election related work. All interested observers have been given the green light to observe the electoral process. The period has also witnessed changing roles for previously powerful groups within the ruling Zanu-PF campaign machinery like the war veterans, securocrats, and traditional leaders. This article traces the changing role of traditional leaders in Zanu-PF’s electoral playbook. The proximity of traditional leaders to ruling elites has always been fluid both in pre- and post-colonial Zimbabwe. Prior to independence chiefs were made into “decentralised despots” used to enforce the will of the colonisers on black Zimbabweans. Numerous laws such as the 1898 Southern Rhodesia Order in Council, the African Affairs Act of 1957, the Tribal Trust Land Act of 1967 and the African Law and Regional Courts Act of 1969 were introduced to cement their powers. Post-independence, Robert Mugabe’s new government first resented traditional leaders, and largely ignored them as an anachronistic vestige of colonialism that had no place in the new administration. It relegated traditional leaders to peripheral zones of governance, condemning them to play customary and cultural custodial roles through the Chiefs and Headman Act of 1982. Only after the formation of the Movement for Democratic Change (MDC) in 1999 and the surge of its support in urban Zimbabwe and promising inroads into rural areas, did government remember the importance of chiefs, putting in place a number of laws to enhance their influence. The Traditional Leaders Act of 1998 was used to restore the legislative powers of the traditional leaders. The penning and ratification of a new Zimbabwean Constitution in 2013 marked another turning point. During drafting, the ruling party wanted to furnish traditional leaders with more powers, while the opposition sought to curb their influence. The compromise became Chapter 15 of the Zimbabwean constitution, which details the roles of traditional leaders. While it recognises the role of the institution of traditional leadership alongside modern state structures, it also sets out standards that all traditional leaders must follow. Section 281 (2) of the Constitution of Zimbabwe outlines some of the acceptable and unacceptable conduct of traditional leaders, stating that they must not be members of any political party or in any way participate in partisan politics, act in a partisan manner, further interests of any political party or violate the fundamental rights and freedoms of any person. In the spirit of these constitutional provisions on traditional leadership, Masvingo High Court judge, Garainesu Mawadze in 2015 made a ruling prohibiting traditional leaders from making political statements and declaring allegiance to any political party. The institution of traditional leadership has maintained its influence and resilience as a result of its community functions. These include being seen as the link between the ancestors and their subjects, their responsibility of protecting and distributing land as well as trying all kinds of crimes and disputes. Given this influence, and rise of the MDC, Zanu-PF could no longer afford to ignore traditional leaders. Having noted the role that some of the chiefs played in mobilising support for the guerrillas during the liberation war, the Zanu-PF government now decided to co-opt them into their struggle against the opposition. Traditional leaders were showered with presents by the government and President Mugabe publicly apologised in 2001 for having neglected the chiefs since independence. More benefits and powers followed, ranging from trucks, houses and land to the mandate to distribute food handouts in times of drought. In return traditional leaders played an active role as electoral ambassadors of Zanu-PF, and remained mute when their subjects were suffering inhuman treatment by forces loyal to the government during election times. The government also instructed them to expel from their chiefdoms members of the opposition party that were branded as “British puppets”. To get food handouts, villagers were supposed to be holders of Zanu-PF party cards. Some chiefs, who in most cases supervised the distribution of this food, announced that the drought relief was meant only for those who support the government. They also allowed the operations of armed youth militias and the establishment of military bases in their areas, effectively sanctioning the beating up and killing of opposition activists. The privileges that the chiefs enjoyed in the 2000s have outlived the Mugabe regime and are still in existence. Following the November 2017 coup, immediately after the inauguration of President Mnangagwa, chiefs were called to the city of Gweru where they were each offered a vehicle. This was after Finance Minister Chinamasa had intimated during his budget statement that the government did not have money and would cut down on expenditures like cars. Despite this early show of returning to the status-quo-ante, the Mnangagwa government has tried to clean up its act, at least in public. This approach has seen the role of traditional leaders in aiding the electoral interests of Zanu-PF retreat, but only to the shadows, taking a more covert character, where they abuse their access to people in order to misinform and manipulate. In Gweru, for instance, traditional leaders were misleading communities into believing that pictures taken during the biometric voter registration process would be used to trace votes. Another strategy that Zanu-PF has employed has been to assimilate traditional leaders into indiscernible party structures. This has been done through making kraal heads and other traditional leaders Zanu-PF cell chairpersons, but without allowing them to have positions beyond, like for example at district or provincial level. A cell is the smallest Zanu-PF structure usually consisting of 50 people. In this way, traditional leaders are part of the Zanu-PF mobilisation mechanism at the very basic level, covertly encouraging villagers to vote for the ruling party at levels that distant observers will not readily notice. In Matobo, Matebeleland South, chiefs reportedly continue to deny those who are not Zanu-PF members access to food aid, while others report opposition supporters to the Zanu-PF structures or the police for victimisation. As a result, opposition parties could not even field candidates in some wards in Matabeleland as their people were threatened, and some had to run for their lives to nearby urban areas like Bulawayo. In the same vein, some traditional leaders continue to act as gatekeepers of communities, only giving their preferred Zanu-PF cronies opportunities to reach out to their areas. In Beitbridge, for instance, some traditional leaders have only invited Zanu-PF leaders to address villagers. In Buhera North some traditional leaders have barred opposition parties from campaigning. Others have been actively campaigning for Zanu-PF. In Guruve South, a headman was seen tearing posters of all opposition parties. He had earlier been seen openly distributing Zanu-PF fliers at a local MDC rally. In Hurungwe West, a headman asked villagers to disclose whether they will be voting and to provide their voter registration slips. There are also a number of reports alleging that traditional leaders have used threats and memories of past electoral violence to coerce their subjects to behave in a prescribed way. Some chiefs are said to have reminded their subjects of the events of 2008, where those who disobeyed the instruction to vote for Zanu-PF were subjected to different forms of violence. While many chiefs continue to support Zanu-PF, a growing number has stood their ground and refused to partake in the repression of their people. In Matabeleland, a growing number of chiefs have been at loggerheads with Mnangangwa’s government. The clashes have mainly been about the restoration of the Ndebele kingdom in that province. In July, three prominent chiefs from Matabeleland won a court order against the Minister of Home Affairs, Obert Mpofu who they allege was interfering with their work. In Midlands Province, a number of traditional leaders addressed their subjects on the need to maintain tranquillity during the electoral season. In Manicaland Province, chiefs have castigated politicians from most political parties for fanning divisions among their subjects based on political affiliation. Other traditional leaders have even defended their subjects by simply ruling that they would not tolerate political violence in their chiefdoms. A good number of chiefs have also been working with the opposition. In Zhombe constituency in the Midlands, it has been reported that almost all the traditional leaders are working with the opposition. 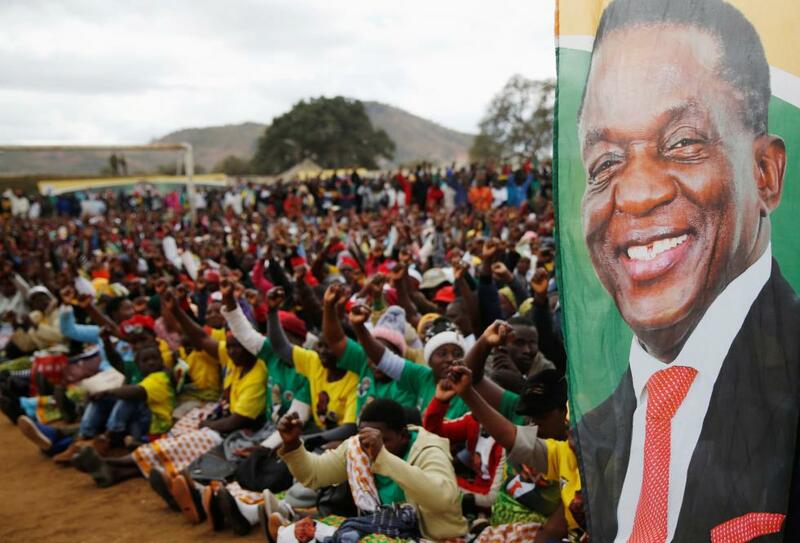 Despite the dramatic political changes that have occurred over the last 12 months, traditional leadership structures remain a distorting political institution in Zimbabwe’s electoral process. While the instruments employed by traditional leaders to influence their subjects have become more subtle, they continue to play an important role to ensure Zanu-PF’s electoral victory. Encouragingly however, this time not all traditional leaders have jumped onto the Zanu-PF bandwagon. A growing number is maintaining their independence. But this may turn out to be too little, too late for ensuring free, fair and credible elections in 2018. On July 30, 2018, Zimbabwe will have its first post-Mugabe harmonised election. This article provides an overview of how the two leading contenders for the Presidency, E.D. Mnangagwa and Nelson Chamisa, have gone about winning the hearts and minds of Zimbabweans in the 2018 electoral race.